I am trying to learn how to use Neural Networks. I was reading this tutorial. and calls it "We can see that the model did a pretty poor job of fitting both the training and the test datasets. It basically predicted the same input value as the output." and says "Looking at the graph, we can see more structure in the predictions." Why is the first "poor"? it looks almost perfect to me, it predicts every single change perfectly! And similarly, why is the second better? Where is the "structure"? To me it seem much poorer than the first one. In general, when is a prediction on time series good and when is it bad? It's sort of an optical illusion: the eye looks at the graph, and sees that the red and blue graphs are right next to each. The problem is that they are right next to each other horizontally, but what matters is the vertical distance. The eye most easily see the distance between the curves in the two-dimensional space of the Cartesian graph, but what matters is the one-dimensional distance within a particular t value. For example, suppose we had points A1= (10,100), A2 = (10.1, 90), A3 = (9.8,85), P1 = (10.1,100.1), and P2 = (9.8, 88). The eye is naturally going to compare P1 to A1, because that is the closest point, while P2 is going to be compared to A2. Since P1 is closer to A1 than P2 is to A3, P1 is going to look like a better prediction. But when you compare P1 to A1, you're just looking at how well A1 is able to just repeat what it saw earlier; with respect to A1, P1 isn't a prediction. The proper comparison is between P1 v. A2, and P2 v. A3, and in this comparison P2 is better than P1. It would have been clearer if, in addition to plotting y_actual and y_pred against t, there had been graphs of (y_pred-y_actual) against t.
It is a so-called "shifted" forecast. If you look more closely at chart 1, you see that the prediction power is only in copying almost exactly the last seen value. 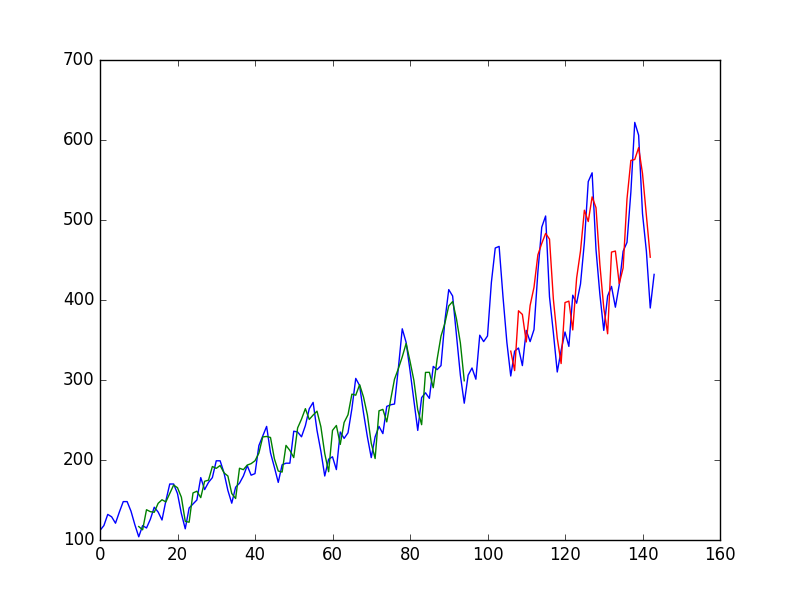 That means model learned nothing better, and it treats the time series as a random walk. I guess that the problem may be in the fact you use the raw data that you feed to the neural network. These data are non-stationary which causes all the trouble. Not the answer you're looking for? Browse other questions tagged time-series neural-networks predictive-models deep-learning prediction or ask your own question. 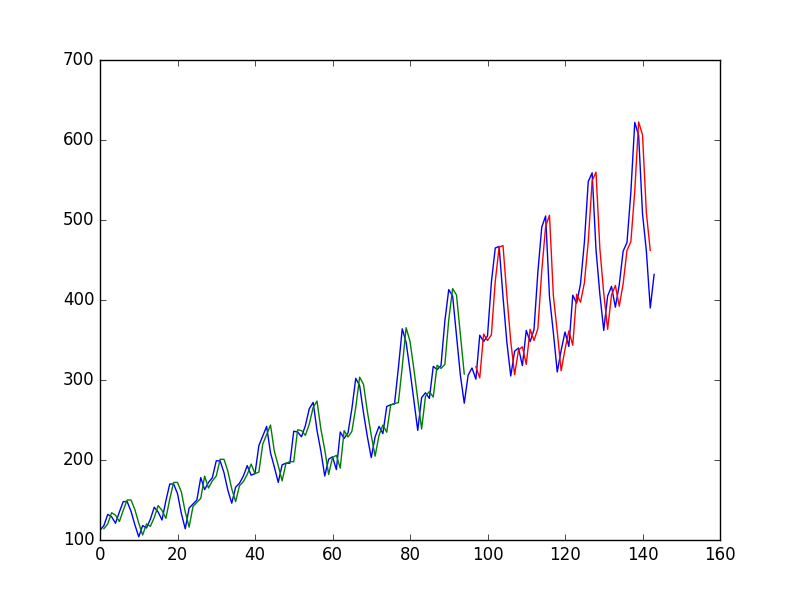 How can I predict one time series using another time series?